I’m playing “revision tag” with my editor right now, which means it’s her turn to read/react to the latest draft of my current manuscript. While she’s “It,” I take a complete break from the work-in-progress and INHALE other books. And wow, I read some good ones this week! They are very different but what I love about each is the narrative device employed by the author. As writers we have to choose WHO tells the story ... but in each of these books, there are multiple WHOs telling a version of the story. The result is a three-dimensional kaleidoscope of narration: we see events from the north-south-east-west-inside-and-out. If you’re trying to figure out how to tell your story, take a look at these for some inspiration/innovation! 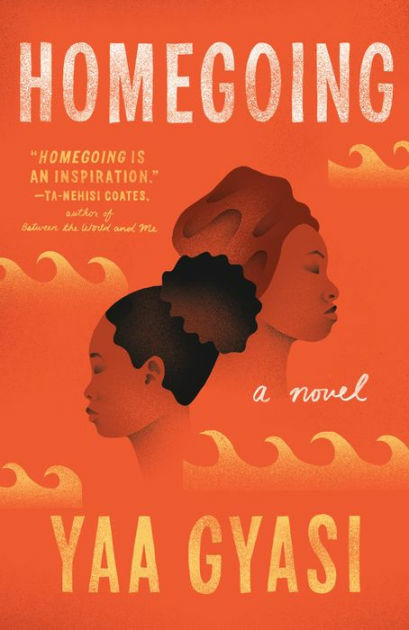 Homegoing by YaaGyasi is a debut (!) which begins in the late 1700s on Africa’s “Gold Coast” (Ghana) and tracks the divergent fates of two half sisters who never meet and whose stories play out on two different continents through multiple generations. Effia is married off to a British naval officer who deals in the slave trade; Esi is captured, sold into slavery and shipped as “cargo” to America. Eight generations later, we see how history, culture and ultimately, choice, bring these broken strands from the same mother back to the same place. Each chapter reads like a short story, told from the POV of a next-gen narrator. 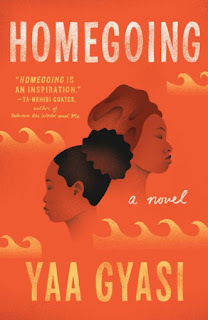 A family tree in the beginning of Homegoing is an essential reference … there are a lot of characters … but the result is both expansive and personal. Gyasi brings individuals and their wrenching stories to life amidst the backdrop of sweeping events. She writes “small” in order to breathe life into the “big.” This is not a historical novel, but rather a family epic played out through history. 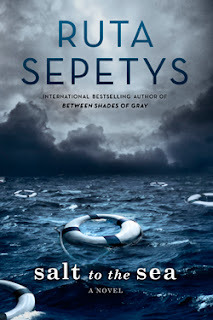 Salt to the Sea by Ruta Sepetys on the other hand, is a historical novel. Based on the tragedy of the Wilhelm Gustloff, a ship filled with refugees, sunk by a Soviet sub in the Baltic Sea in 1945, the story is brought to life via FOUR narrators: an East Prussian teenager, a Lithuanian nurse, a Latvian girl and a young German sailor. I’ve attempted two alternating narrators before, but never four! Sepetys pulls it off brilliantly, due, I think, to keeping each chapter very short. She never bogs down and instead captures a particular incident and unique, personal reaction from a character in every chapter. I remember years ago visiting the Famine Museum in Strokestown, Ireland, and our guide pointing out how their goal was to move beyond the conventional history-telling of the “big house,” the rich and powerful, and tell the stories of the ordinary people: the stories from the potato ridges one can still see in the fields. When Sepetys was researching Salt to the Sea, she visited a museum where they displayed notes-in-bottles which had been hastily written and tossed into the freezing ocean by passengers from the Wilhem Gustloff. Her goal with this novel was to bring their stories and voices to life, and she achieves this, resurrecting the individual stories which become lost in the great sweep of big, historical events. 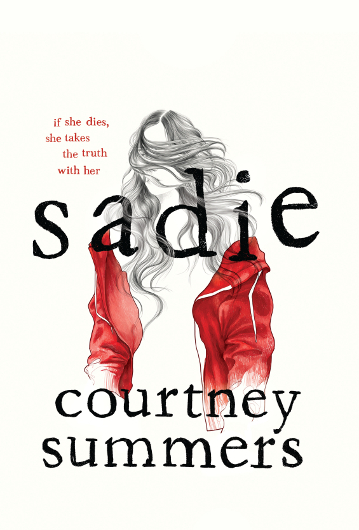 Sadie by CourtneySummers, which is fresh on the shelves this month, is wonderfully innovative. The narrative alternates between Sadie’s dark, emotionally wrenching first-person account and a somewhat ironic podcast script “narrated” by a DJ who has been charged with uncovering her story. I’m guessing this is inspired by NPR’s brilliant podcast, “Serial,” which slowly unravels one true story over a series of episodes. Basically: Sadie is missing. Her younger sister has been brutally murdered, her killer never found, and months later Sadie has disappeared as well. Like the reader, the DJ becomes increasingly drawn into the “What really happened?” and tries desperately to catch up with the missing Sadie before she becomes yet Another Dead Girl. The tension Summers creates by juxtaposing Sadie’s real-time narrative with the fits-and-false-starts investigation by the DJ is terrific. I found myself turning pages quickly and gasping in dismay at points: she totally hooked me. This device also breathes life into secondary characters, as the DJ interviews the various people who know or encountered Sadie along her journey. It’s a truly inventive way to tell a story. Okay, I’ve probably got another week before I have to dive back into MY latest story, so next in the queue: Samantha Mabry! I’ve got A Fierce and Subtle Poison and All the Wind in the World on my night table right now. Also fresh out this month: Nova Ren Suma's A Room Away From the Wolves. And in October, Kelly Jensen's (Don't) Call Me Crazy.